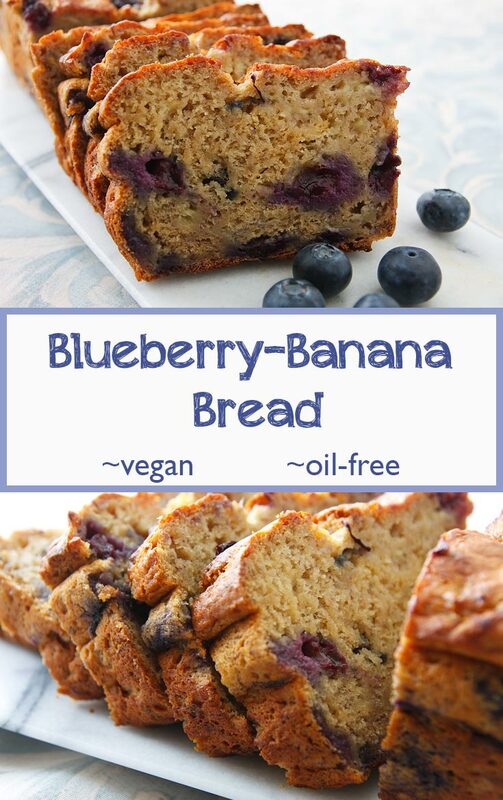 Using bananas instead of oil makes this fat-free banana bread extremely moist and lightly sweet, and the blueberries add a fruity surprise to every bite. Q: What’s black and yellow and soft all over? A: The bananas on our kitchen counter when we got home from the beach on Sunday. Of course, when we left on Thursday, the bananas were firm and yellow, even a little green. I’d meant to take them with me, but in the rush of packing I forgot. By the time we got home, our bananas were so overripe that I could actually smell them as we entered the door. But you know the old saying: When life gives you mushy bananas, make banana bread! Well, I may have just made that “old saying” up. Nevertheless, it’s true that the riper the bananas, the better the banana bread, so finding several overripe bananas on my kitchen counter was not a hardship at all but an opportunity to make a treat for the family. 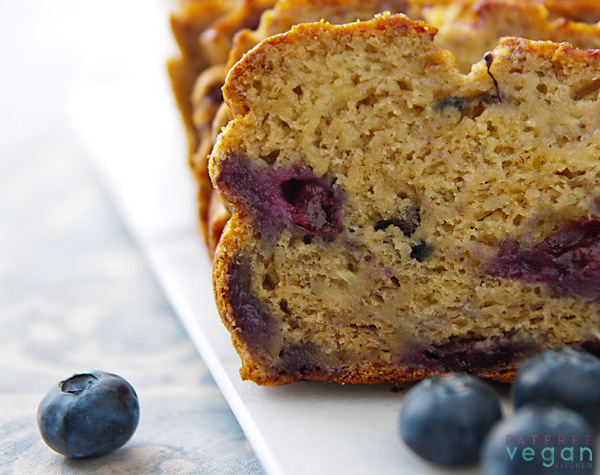 And since it’s blueberry season here, I saw it as a double opportunity and filled my banana bread with some of the plumpest, sweetest blueberries I’ve ever tasted. 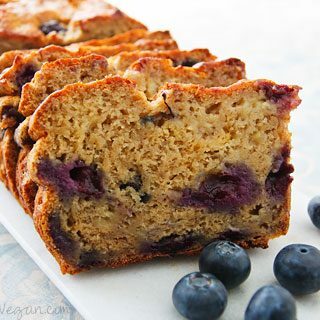 The result was incredible: The bananas make the bread extremely moist and lightly sweet, and the blueberries add a fruity surprise to every other bite. 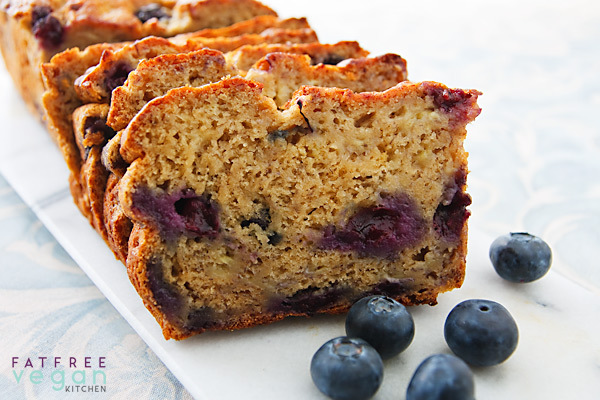 If you like bananas and blueberries, I think you’ll love them together. 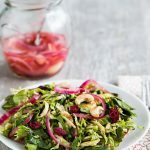 Before I hit you with the recipe, I want to let you know that the Tried & Tasted roundup has been posted over at Holy Cow. 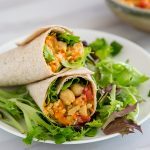 I mentioned before that people would be making recipes from this blog and then sharing them on their own blogs. Well, I’m just overwhelmed at the response: I counted 39 different entries, some of them of recipes I’d forgotten I made. It’s going to take me a while to go through them all, but I will! Please visit some of them yourself–and tell them I sent you. Preheat oven to 350F. Spray or wipe a 9×5-inch loaf pan with oil or use a silicon loaf pan. In a large bowl, mash the bananas and add the remaining lemon juice, soymilk, and agave nectar. Stir well to combine. In a separate bowl, combine the flour, baking powder, soda, and salt. Add the dry ingredients to the banana mixture, and stir just until the mixture is well-combined. Fold in the blueberries. Spread the mixture evenly in the prepared pan and bake until a knife inserted in the center comes out clean, about 50-60 minutes. Allow to cool before cutting into 12 slices and serving. As written, contains 5 Weight Watchers smart points per serving. Instead of agave, substitute 1/4 cup sugar and 1/4 cup Lakanto Sugar-Free Maple Flavored Syrup to reduce a serving to 4 points. My bread came out chewy and underbaked, despite leaving it in for 70 minutes. It was also very sweet, and I probably wouldn’t combine bananas an blueberries with nectar again. I used Almond milk instead of soy, and I added 1/4 cup more blueberries, because I wanted to use up what I had left. The bottom half and ends of the loaf were very underbaked. How essential is using soy milk and lemon juice to curdle? Could home made almond milk be subbed instead? Almond milk should work just fine. Hope you enjoy it! Thanks for your reply Susan. I made it as per recipe with soy milk and it was delish! Will try almond milk next time. Is it possible to only use baking soda? No baking powder? And is it possible to not use the salt? Baking powder and salt both affect the rising of the bread, and leaving them out might give you bad results. You could look online and see if there is a substitute for the baking powder but I don’t really recommend it. I made this today and it turned out great. I baked it for 50 minutes and it was perfect. I have a particular pet peeve about people who substitute like 5 of 9 ingredients and then complain that it didn’t turn out right. Sheesh! That said, I will admit that I used coconut milk instead of soymilk and maple syrup instead of agave, because those are what I had. Having read the comments it appeared that those substitutions would not mess with the chemistry or wet weight of the batter and they didn’t. Yay! I just made this bread and it’s pretty good. I made it into 12 muffins instead of the loaf and baked at 350 for 20 minutes. I also reduced the agave by about half (maybe even less than 1/4 C… I eyeballed) and I regret doing that because the muffins really are not sweet enough. So I just made a little icing glaze and spread that on top of the muffins. Hopefully that helps. Either way, this bread is decently moist and a bit dense and chewy. Overall good! I’ve been making this recipe for 4 years, so thought I should finally comment. 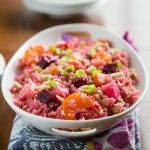 This is one of my go-to desserts as it’s easily portable, always comes out great, and even omnis devour it not knowing it’s vegan let alone oil-free and whole grain! The only changes I make is I use whole wheat pastry flour and raw sugar instead of agave. I haven’t needed to modify the liquid ingredients because the sugar basically melts while cooking. I’m always recommending this recipe to other people too. Thanks Susan, your website really is a treasure trove of delicious recipes! I would prefer to use coconut sugar instead of agave. Did you use 1/2 cup of raw sugar as substitute? Thanks! 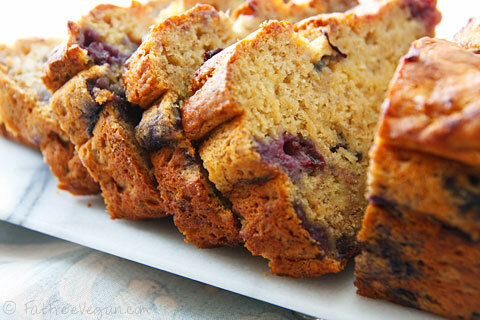 This is hands down the best ever recipe for a vegan quick bread! I substituted maple syrup for the agave (and actually reduced the amount to 1/3 cup and it was still plenty sweet for us); I also added 1/2 cup of cornmeal in place of 1/2 cup of the flour and thought it added a nice texture. I’ve been searching and searching for a vegan quick bread — and have tried several only to end up with either gummy, flat, or very dry breads. This recipe is just perfect — as are all of Susan’s recipes here! Hi Susan! Just wondering what the shelf life is for this banana bread? What is the best way to keep it moist after I bake it? I have made this bread on numerous occasions which has been delicious every time 🙂 I am hoping that it could last until Thursday if I made it today. I think it could easily last three days, but I would refrigerate it just to make sure. I made this today as a breakfast bread. I added chia seeds flax, pumpkin seeds and sliced almonds. And for the sweetener I used about 1/2 cup of honey. It came out great. Light and fluffy. Oh I also added a little more almond milk than what it called for about 1/2 cup extra. Excellent recipe! I just made it, with applesauce, not soy milk, and my vegan and non-vegan children love it! I followed the recipe exactly but did leave it in the oven for an additional 15-20 minutes. Will make again very soon. Thanks! I’ve been using this recipe as a template for breakfast muffins for ages and today’s batch was perfection. I used applesauce instead of soymilk, freshly ground oat flour instead of wheat, an extra banana instead of the agave, and added a heaping 1/4 tsp ground cardamom. Baked for 20 minutes at just a bit over 350° (but who really knows with my oven). Yum! I personally haven’t, but if you check the comments, I’ll bet there are people who have made it will different flours. This did not cook. Even after an extra 20 minutes in the oven, it was raw. Very disappointing because the ingredients were expensive and are now wasted. That’s very disappointing! I don’t know what could have gone wrong because I’ve never had that happen. Our family loves this bread! Due to allergies, we did not use the soy milk. We made 3 mini loaves and let them cook for 40 minutes. They turned out great! I love sweets and I did not find this to be sweet at all. They were not gooey or sticky either. Our picky 10.5 year old ate 1 loaf all by himself withing a couple of hours. He even asked it I could make it daily. It is not often that our family finds baked goods that do not contain egg or other allergens. I will be trying it will the Bob’s Red Mill Gluten Free 1-to-1 Baking Flour. I except that to turn out sticky but I want to try it. 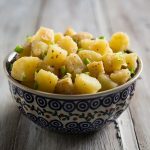 Thank you for a great recipe that our family enjoys! Sometimes replacing the flour with a gluten-free baking blend works, but I haven’t tried it myself. I just tried to make it and it was an absolute disaster – stayed in the oven for over 80 minutes and not even half baked! Only substituted soy milk for coconut milk, otherwise followed the recipe. I’ve never heard of that happening. Coconut milk may have made a difference, depending on the kind you used. Otherwise, I would check your oven’s thermostat. I made this today as a breakfast treat. I used spelt flour and silk almond/cashew protein milk and it was great. This recipe was light and moist. I think next time I will omit the blueberries and instead use walnuts and chocolate chips!